The highlight of Villa Ariet has to be the spectacular view of the open sea, making it a fantastic addition to our Very Villa Plus programme. It's superb seafront position also means the picturesque Cala Serena Beach is only a few minutes' walk away, as well as a supermarket and restaurant. This impressive 4 bedroom villa has a spacious lawned garden and views of the sea from the living area. Plus, WiFi and air conditioning/heating in the lounge and 3 of the bedrooms are included. The incredible scenery! 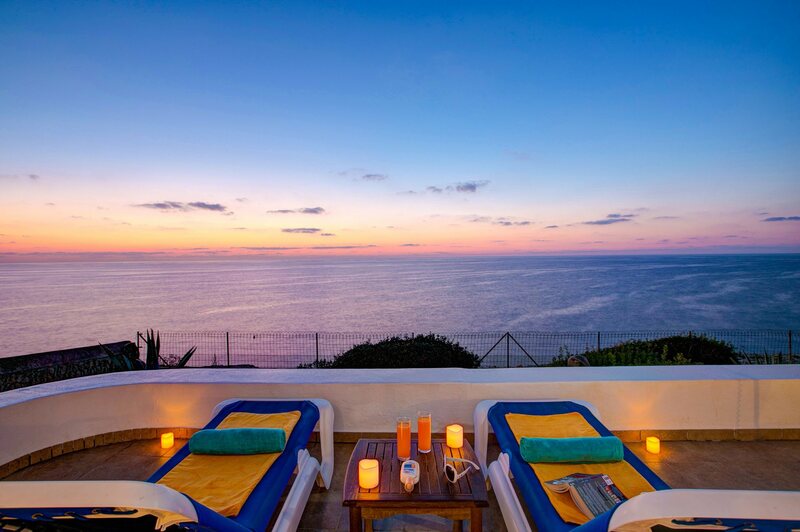 That gorgeous panoramic sea view really makes Villa Ariet stand out from the crowd. The best place to enjoy that stunning view is from the rear terrace accessed from the lounge or far side of the pool area. The sheltered, sea-facing terrace comes complete with a table and seating - the perfect idyll from which to enjoy the landscape. Sun-worshippers will also have plenty of space to relax on the sun terrace by the private, salt water pool. You'll also have your own brick BBQ to cook up some typical Spanish tapas before sitting down by the waterfront to dine alfresco. Electric gates with an entry-phone system, open onto the villa's private parking area. The main entrance is at the front of the house, by the private swimming pool. The combined lounge and dining area has patio doors onto the spacious sea-facing terrace at the rear. There is comfortable seating, a feature fireplace, flat screen TV and a table and chairs. The fully equipped kitchen is adjacent and has all mod cons for a relaxing stay. There are 3 bedrooms in the main part of the villa; 2 twin bedrooms and a double bedroom all sharing 2 separate shower rooms. The twin bedroom adjacent to the lounge has superb views of the sea from the patio doors onto the terrace. The second double bedroom has an en suite shower room, and can only be accessed from the pool terrace. Positioned right on the water's edge, Villa Ariet affords spectacular views over the open sea. The villa is perfect for keen beach-goers, just a short stroll from the sandy bay of Cala Serena. You will have a restaurant nearby as well as a supermarket to stock up on your daily essentials. But venture into the centre Cala Ferrera or marina of Cala D'or for a much larger selection, around 30 minutes' away on foot, or a few minutes by car. If you don't want to hire a car, there is a bus stop very close by, getting out and about couldn't be easier! The individual areas of Cala D'or all have a selection of shops and places to eat, as well as the beaches and central marina. The centre of Cala D'or itself has a picturesque pedestrian area lined with pavement cafes, chic restaurants and open air bars. The nearest beach, Cala Serena, is a 7 minutes walk away. But, this chic resort has 7 sandy beaches all within a 1 mile radius of one another - a great choice for beach lovers! To the north and south of the villa, there is also a succession of rocky coves, ideal for sunbathing. A number of attractions and family activities can be found within a relatively short drive. Children will love the Aqualand Waterpark in the area of El Arenal, both around 50 minutes' away by car. The stylish marina is definitely worth a visit during your stay in Cala D'or. The marina is really the heart of the resort, attracting some of the most impressive yachts and power boats from around the world. A must-see for any island visitor! The resort also has an 18-hole golf course, Vall D'Or Golf, within easy reach of Villa Ariet, as well as a choice of alternative sports facilities. Villa Ariet is not available to book for season as it is sold out. Take a look here at the Majorca villas that are currently on sale. Aqualand is a place for the whole family to enjoy, there are plenty of different shapes and sizes of slides for everyone, making this is an ideal place for a great family day out. Vall D'Or is situated in the municipality of Felanitx only 2 miles from Porto Colom and 4½ miles from Cala D'Or, two of the most beautiful spots on Mallorca's eastern coast. It is a pretty course and offers visitors a friendly welcome. Location: on the Porto Colom to Porto Cristo road.